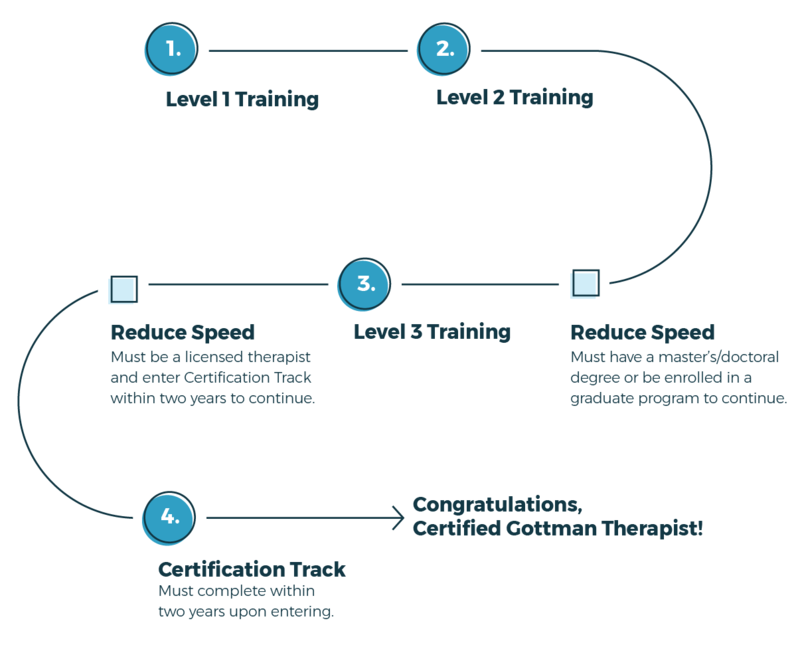 The Roadmap to Certification in Gottman Method Couples Therapy is the path you’ll take on your journey toward becoming a Certified Gottman Therapist. Through each level of training, you’ll learn proven assessment techniques and effective intervention strategies that have helped millions of couples worldwide. After you’ve completed Level 1 Training, Level 2 Training, and Level 3 Training, you can enter the Certification Track, where you will be paired with a consultant to continually hone your skills and master the Gottman Method. Level 1 will introduce you to the most important concepts of the Gottman Method, including fundamental assessments and interventions, and you will learn how to teach those interventions to couples so that they can use them on their own. Level 1 Training is for mental health providers, allied professionals and clergy, students and interns, family clinic staff, professors/teachers of couples therapy, researchers in the social sciences, and employee assistance professionals. There are no prerequisites. Level 1 can be completed in person, as an online course, or by DVD set. Level 2 builds upon and refines the skills you learned in Level 1. It provides a wealth of information about relationship theory, observation, couple dynamics, relationship assessment, treatment planning, when and how to use interventions, and working with co-morbidities like affairs and addictions. Level 2 trained therapists are eligible to be listed on the Gottman Referral Network. Completion of Level 1 is a prerequisite. Level 2 can be completed in person, as an online course, or by DVD set. Level 3 Training is an advanced practicum workshop that is only offered in person. It delves into the true resistances and co-morbidities we face as therapists, and how we can transform them into effective healing methods for our clients. In a small-group setting, you will have the opportunity to practice and refine your use of Gottman Method Couples Therapy and receive personalized guidance in developing a roadmap for making sound clinical decisions. Completion of Level 1 Training and Level 2 Training is required, as well as a master’s degree, doctoral degree, or current enrollment in a graduate program within a mental health-related field. Therapy experience is highly recommended, but not required. The final step in the Roadmap to Certification is the Certification Track, which includes consultation with a Certified Gottman Therapist and video review of your ability to demonstrate Gottman Method Couples Therapy in your practice. We strongly encourage you to enter the Certification Track immediately after completing the Level 3 Training. You will have a maximum of two years to enter the Certification Track following your Level 3 Training and a maximum of two years to finish the Certification Track upon entering. Following certification, you will have the opportunity to enroll in our train-the-trainer program to present your own Level 1, Level 2, and Level 3 Trainings in Gottman Method Couples Therapy. You can also train to present The Art and Science of Love and The Art and Science of Love 2 weekend workshops for couples in your community.